Talking Politics - New Council Assignments: "Jerry McDermott may be the biggest winner; he loses Utilities but gets Ways & Means -- which Consalvo cannot be happy about losing -- and Financial Services/Community Investment"
Tempers flared and questions remained unanswered at a fiery meeting of Allston residents and Harvard officials last Wednesday. The meeting marked the first discussion with Allston residents since the University released a robust 50-year plan earlier this month for its fledgling campus across the Charles River. Allston resident Matthew Snyder expressed frustration with the University’s response. “I come to these meetings for answers. And I didn’t get any,” Snyder said. “I think there’s a huge disconnect between the community of Allston and Harvard,” he added. Pete Sampras, one of the best tennis players in the history of the storied game, will be coming back to play competitive tennis very soon. However, fans won't be seeing him on a court trying to stop Roger Federer from breaking his Grand Slam singles record. Instead, he will be playing in tennis' senior circuit for players over 30. Sampras let his intentions be known in an interview with AP. He said his first match back will be in the Outback Champions Series tournament scheduled for May 2-6 in Boston at the Boston University Agganis Arena on Comm Ave in Allston. Learn about what is happening in Allston Village and meet Mark Hayes, our new police captain. Cash bar & FREE FOOD from Allston Village's newest restaurants. A new program, Boston About Results, was launched last summer to provide the mayor, and citizens, quantitative measures of how well the city is providing the services it promises. This Globe article looks at the results and publishes the "report cards" for several City departments. An interesting op-ed piece in today's Times. Brings to mind the many ways that our neighborhood could be more pedestrian and bike friendly on Western Ave, N Harvard, Cambridge St, from our homes to the river, and throughout the area. Residents seek details of Harvard development plans - The Boston Globe: "'We need to know exactly what they want to do and when they plan to do it,' said Representative Michael Moran , who represents most of North Allston. 'My district also includes Boston College, and I can tell you everything they plan to do over the next 15 years. We don't have anything near that specificity with Harvard. These things need to be worked out before they put a shovel in the ground.'" How many new Allston residents & how much new open space? At the Harvard Task Force meeting and in other presentations, Harvard is talking a lot about the new open space in their 20 and 50 years plans for North Allston. What hasn't been discussed as much how many new students would be living here. These two issues really can't be separated, so here is a view of the whole picture. Harvard's 20 year plan proposed 1.4 million square feet of new housing in North Allston. This is 800,000 sq ft of undergraduate housing, 350,000 sq ft of graduate housing, and 250,000 sq ft of Business School housing. How many people would live in 1.4 million square feet of housing? Harvard estimates that there will be 590 beds in the 350,000 square feet of graduate housing. That is 600 sq ft per bed. How many people sleep in each bed is another question, but I will assume it is 1 for the sake of this estimating exercise. 1.4 million square feet of housing & 600 sq. ft per person = 2,300 additional Allston residents. If new open space should be created at the same time new residents are added at the 7.4 per 1000 ratio, that means that 17 acres of new open space should be created to accompany the 2,300 new Allston residents that Harvard plans to add. Harvard's press release that accompanied the 50 year plan announces an intention to "create more than 30 acres of new open space". In the 20 year plan there are 3 acres of open space in Rena Park and an unspecified amount of open space that burying Soldiers Field Road and a Science Courtyard would create. More information about open space in Allston/Brighton is in the Boston Open Space plan. The Allston/Brighton portion of that plan is here. Crowds blast Harvard plan - Allston/Brighton TAB: "Nearly 200 people, many sporting “Harvard You Need to Do Better” stickers on their lapels, packed into the Honan-Allston library Wednesday to learn about Harvard’s Allston expansion plans, and to express both feedback and frustration with the university’s recently released 50-year Institutional Master Plan." Mayor Thomas M. Menino scrambled back to Boston last night from the nation's capital, outraged after a much publicized deal to sign Manuel J. Rivera as school superintendent collapsed without notice. Is Harvard thinking generously about its plans for Allston? Here is a what a major Harvard arts benefactor said when Harvard was planning a new art museum for Cambridge a few years ago. That project was not built due to community opposition, but I think the sentiment is just as applicable here in Allston. "If a museum of modern art is built on that site, I hope that Harvard will think big and generously about it. Let the museum have breathing room. When the Fogg was opened in 1895, a blueprint existed that showed how it might one day expand onto the adjoining site, where the Carpenter Center went up instead in 1963. The Fogg has suffered from being hemmed in by the Carpenter Center. I would be terribly disappointed if that happened at the river site. The Sackler and the Busch-Reisinger Museum in Werner Otto Hall are not what they ought to be, and even when new they weren't. Let's not do something typical of so many Harvard projects and make a building that isn't what it ought to be." This document has been posted on the BRA's website. There are two versions. Immigrant sentenced in bribery case - The Boston Globe: "A federal judge sentenced an undocumented immigrant who operated an Allston cleaning company to five years in prison for harboring other undocumented immigrants and bribing an immigration official. US District Judge Morris E. Lasker also ordered Jose Neto, 40, to forfeit to the government a multifamily residence he owns in Allston"
City councilors are expected to pass a home-rule petition today to put liens on the properties of those with unpaid trash fines, a move that comes days after the Herald reported Boston has not collected $3.4 million in code violations. Several influential department heads at Harvard Medical School are discussing the possibility of moving hundreds of researchers and staff from the Longwood medical area to Harvard's emerging campus in Allston. The proposal under discussion, though still in very preliminary stages, could shift nearly half of the people now occupying the iconic quadrangle at the heart of the medical school -- up to 70 professors and 500 to 700 staff members -- to a new 1-million-square-feet building in Allston. Here's a chance to learn more about how Harvard and other universities cooperate across the river in Cambridge. Town Gown presentations will take place at the Tuesday February 6 Planning Board meeting which begins at 7:30. The meeting will take place at the Cambridge Citywide Senior Center at 806 Massachusetts Avenue. For more information contact Cliff Cook, Planning Information Manager, Cambridge Community Development Dept, ccook@cambridgema.gov, 617/349-4656. The 2006 Cambridge Town Gown reports from Harvard, MIT, and Lesley are online. One of Allston's State Senators, Jarrett Barrios, has a blog. Check it out! "As part of a massive 50 year plan to expand its Allston campus like some matter of smug Crimson tumor, Harvard announces plans to bury part of Soldiers Field Road underground to make way for a riverside park. Working-class JP residents are advised to stay away from it, for at least two reasons. MINUS 1"
Thanks to Peter Wallace for sharing this perspective in today's Boston Globe. Click the image here to see a larger view. The GlobeWatch column from last Sunday ("Illegal parking lots pockmark Brighton neighborhood," Jan. 14, City Weekly) concerned illegally paved parking lots on residential property in Cleveland Circle. However, this problem is ubiquitous and deserving of far greater attention by the Globe. When fire broke out at an artists complex on Rugg Road in Allston in the early-morning hours of Dec. 29 , the impact was immediate for those who lived and worked there: about 30 people displaced, with several units damaged by fire, smoke, water, and the ax blows of firefighters. Roughly half are now back in their homes and work spaces, with the remainder waiting to hear when, or even if, they will be allowed back in. The future is even more uncertain for an artistic event and community known as Pan9, centered on the top-floor, five-bedroom space where the fire started. Because Harvard's plan essentially privatizes an entire neighborhood, and to the untrained eye—mine—there are some real questions here." 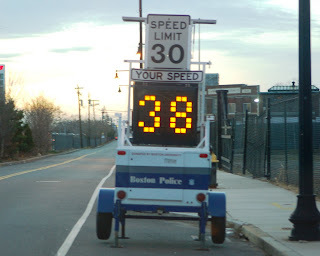 It is great to see this speed display unit on Lincoln Street near the intersection with Everett St to help slow down traffic and make the neighborhood safer. Lincoln St has been the scene of numerous accidents over the years, including a bicyclist hit by a car and killed a couple of years ago and various incidents when cars have skidded off the road and hit walls and fences along the side of the road. It is ironic that this piece of equipment, parked in front of the building Harvard bought last month for $16 million, was donated to the City by Boston University (note the small red letters on the main box of the machine). cbs4boston.com - Several People Evacuated After Allston Fire: "A building fire forced about 20 people from their homes in Allston overnight. The fire broke out in the basement of 375 Commonwealth Ave. and quickly spread to the first floor"
"In what will be the second such filing by a major Allston-Brighton institution within a two-month period, Boston College is readying itself to file a 10-year Institutional Master Plan with the BRA." The BC task force meetings are open to the public and are scheduled for the third Tuesday of every month at the Brighton Marine Health Center, 77 Warren St., Brighton, 6:30 p.m. The Allston Brighton/Boston College Community Fund Committee has announced that three additional grants totaling $175,000 will be distributed in February, 2007. Fair alcohol license distribution debated - Allston/Brighton TAB: "As several Allston-area restaurants begin the process of applying for some of the city’s 55 newly minted liquor licenses, residents and civic leaders are debating what is the most fair and equitable way to approve or deny these applications, and what the impact on the community will be. " This is in the "must read" category. It is an interview by Herald Columnist Virginia Buckingham with Mayor Menino about the future of Allston. New building projects inevitably scare residents. If it happens in their neighborhood, they are often forced to reconstruct their lives. So when Harvard University announces a multibillion-dollar, 200-acre plan to build what it hopes to be a sort of Harvard Square 2, it's no wonder many Allston inhabitants are weary. A project requiring 8,712,000 square feet to create will intrude on residents' space. If the construction doesn't physically knock down their homes, the increased cost of living could be enough to kick much of the population out. In an area where the median income is $38,941 and 23 percent of residents live in poverty, according to the Allston-Brighton Data Profile, building a high-class shopping area that could become Boston's newest tourist trap won't exactly lower rent prices. Related to Harvard's suggestion for art and cultural buildings in Allston, this story is about what other museums in Boston do in the evenings to help make Boston a fun and interesting city. The MFA is open late on Wednesdays, for free, and on Thursdays and Fridays at regular price. The museum's most popular night is the first Friday of each month, when it holds parties for young professional types. The new Institute of Contemporary Art also has a free night, on Thursdays, and the Museum of Science offers special programs and gourmet dishes on Friday nights. The Isabella Stewart Gardner Museum keeps its doors open late for special concerts, like the Feb. 16 "Composer Portraits" program featuring pieces by Conlon Nancarrow. Is it time for a Harvard room in Allston? More than a year ago, Harvard opened a room in Harvard Square for people to learn more about Harvard's plans in Allston. Recently, Allston residents have correctly pointed out that this isn't particularly practical or useful for Allston residents who have jobs and can't get to Harvard Sq between 11am and 2pm on Tuesdays, Thursdays, and Fridays to take a look. We all know that Harvard has a lot of empty office space in Allston. Maybe they could convert space in the KMart building into a "Harvard Room" here in Allston. Even if it was open one day a week (how about Thursdays from 2-8pm) it would give many people in Allston a chance to better understand Harvard's plans. The exhibit could have, among other things, architectural models of the Allston neighborhood and the projects that Harvard has proposed, especially the buildings that Harvard wants to start building this year. Please attend an Allston Room Open House to learn more about the project from Chris Gordon, Chief Operating Officer and Kathy Spiegelman, Chief Planner, Allston Development Group. The human scale vanishes in enormous buildings. People who use them stop identifying the staff who work there as personalities, and the staff feel like small cogs in a greater machine. THEREFORE: To maintain human scale in campus buildings, make them small, perhaps no larger than 100,000 gross square feet (with some notable exceptions such as libraries and recreation facilities) and not more than three or four stories high. If more space is needed, the buildings should be conceived as a collection connected by arcades or bridges defining and embracing outdoor spaces. It’s easy to be so focused on making campus projects as wonderful as possible for their users that we ignore their impacts on our neighbors. THEREFORE: Consider each project’s impacts on neighbors and community. For example, what will the building look like from outside the campus boundaries? What parking impacts may spill over into other areas? An important aspect of the campus’s beauty is access to sunlight, views of the sky, and human scale. THEREFORE: Keep the majority of buildings four stories high or less. It is possible that a few buildings may exceed this limit, but strong consideration must be given to the resultant shadows and skyline to ensure the beauty of the campus and the importance of the individual. When a university campus is separated from the town by a hard boundary, students and townspeople tend to be isolated from each other; in a subtle way the university takes on the character of a glorified high school. THEREFORE: Ensure that the campus edges are soft and the gateways marking the boundary between university and town are welcoming and inviting to townspeople rather than shunning. For students, make easy connections to the town so they are encouraged to visit the town often. "BOSTON IS on the verge of a building boom without a permanent director of the Boston Redevelopment Authority, the city's planning and development agency. Mayor Menino may be hands-on when it comes to development, but there are more projects in play than he could possibly juggle. And his judgment is anything but flawless in this area. The next BRA director will soon see that even the simple stuff can be complicated. Suffolk University recently responded to the mayor's call to build dormitories as a means to ease pressure on the housing market in surrounding neighborhoods. But the Suffolk dorm proposal enflamed Beacon Hill residents instead. The BRA downsized the dorm out of respect, and Suffolk complied. Suddenly the mayor wearied of the whole thing and killed the project. Sunil Abraham notes how many universities wall themselves off from the surrounding communities, either literally or figuratively. After a Brighton resident complains to the Globe about paved front yard parking lots, a code enforcement officer from Boston's Inspectional Services issued citations to 14 homeowners for violating the city's zoning ordinance. During an evening inspection of the same area on Dec. 14, enforcement officers found more than 100 cars parked in illegally enlarged driveways and parking lots. Some vehicles blocked sidewalks or were unregistered and abandoned. They issued 14 citations to these landlords and fined them $150 a piece. Fines jumped to $300 each for last week's round of tickets because it was the second violation for most in the last 12 months. "The compatibility issue is really the main problem," said Ray Mellone, chairman of the Allston community task force on the Harvard expansion, referring to fears that traffic and bustle would invade the neighborhood. The university will also need approval from the state Department of Conservation and Recreation, which manages the land along the river, and from the state Historical Commission to put Soldier's Field Road underground and for other construction along the Charles River. Secretary of State William F. Galvin, who chairs the Historical Commission, said the university's plans to submerge the roadway and build a pedestrian bridge over the Charles appear mainly to benefit the university and not members of the community. "Clearly, the university is treating the river like some moat that they own," Galvin said. "It is not theirs, and it will be protected." "We're not presuming we can do all this," said Christopher M. Gordon, chief operating officer for Harvard's Allston Development Group, which is managing the expansion. "We want to make sure we work with everybody." Thanks to Sophia for mentioning this post about Harvard's expansion plans and the possibilities for expanded public transportation. “It’s definitely different from the norm,” said Gerald Autler, the project manager for the Boston Redevelopment Authority . Harvard’s chief planner for Allston, Kathy Spiegelman, said the plans would create a “professional school corridor” by relocating the School of Public Health and the Graduate School of Education nearer the existing Business School site. Harvard’s relationship with residents of Allston, and Charlesview in particular, remains fraught. Occupants protested the building’s board of directors’ decision to cooperate in a land swap with Harvard last November. Richard Harding, Jr. of the Cambridge Public School Committee has blamed Harvard for doing little to help local poor and under-performing public schools. “I really need to know what the hell are they doing for us,” he said. Ten years after covertly buying land in Allston, Harvard has yet to publicize how its expansion will affect local residents. Community meetings and donations to build a library are no more than an excellent public relations campaign if the University ends up driving out residents. We must repair our image in our neighborhood and defy stereotypes about the Harvard bubble and its self-interested policies. The integrity of this institution rests not just on tallying up its Nobel Prize count, but also in the fair treatment of its workers and in its social and environmental responsibility to the community. Similarly, the president must not weigh Harvard’s global prestige before its responsibility to its community, both in and outside its walls. Secretary of State William Galvin, who serves as chairman of the Massachusetts Historical Commission, said Harvard’s plans to expand the bridges and bury portions of Storrow Drive could run into trouble. He noted that the Charles River’s basin is protected and that he’ll closely review Harvard’s plans. He said he’s worried that the plan could “adversely affect” the river. “I’m very concerned,” said Galvin. Harvard has unveiled a vision for its future, filing with the City of Boston a proposed Institutional Master Plan for the first stage of the physical evolution of an interdisciplinary campus in Allston. Experts at Harvard and elsewhere agree that we should strive to reduce or eliminate segregation based on race or income. In Boston and across the country, policies are being created to encourage a mix of incomes in housing developments and neighborhoods. Examples include the Federal Moving to Opportunity for Fair Housing (MTO) and HOPE VI programs. In this Harvard paper, researchers discuss the favorable results of the MTO program in Boston. Another Harvard paper addresses the complexities of housing policy and makes the case that mixed-income housing is not a "silver bullet". What is clear is that thousands of new people will move to North Allston & North Brighton in the upcoming years and a new Charlesview development would be the first major housing development here in decades. It could significantly alter the demographics and appearance of the neighborhood. North Harvard Street could become a dividing line, with Harvard people isolating themselves to the east of the neighborhood in new enclaves. Where the newcomers to our community will live and the type of housing that should be built are not simple questions. But they are very important ones. 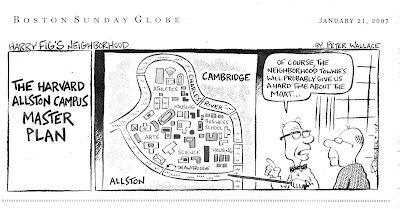 The housing goals in the North Allston Strategic Framework were a good start. Now we need Harvard, the City, the community, and others to begin serious planning to fulfill these goals before major development moves forward. Harvard has the expertise to significantly contribute to a world-class housing plan for this community. Harvard claims to be interested in the success of Allston. Harvard says that housing policy is one of the most important factors in the success of a community. It is time for Harvard to follow up its talk about "partnerships" and "shared vision" with real action. Last night was the Mayor's State of the City address. Here are links to the associated press release and the full content of his speech. My favorite phrase from his speech is the emphasis on "the places that put life in city life." It is that sentiment that leaves many of us so troubled when we look at the vacant Harvard-owned buildings in AB North. (Thanks to Tim McHale for creating that new phrase. It is so much easier to say and type than "North Allston and North Brighton"). It is the same lens through which we look at Harvard's new proposals, trying to see how they will put life into Western Ave, not just for Harvard affiliates but for everyone in the community. Short list emerges for top job at Harvard - The Boston Globe: "Albert W. Merck, a prominent alumnus and donor, said it will take someone with extensive administrative experience to execute the university's ambitious agenda, which includes expanding into Allston and improving the undergraduate experience and quality of teaching." I think it is interesting that Harvard's Allston expansion is viewed as so important to Harvard that it may be shaping the selection of Harvard's next president. Menino takes the stage at Strand tonight - The Boston Globe: "The 7:30 p.m. speech will be broadcast live on WCVB-TV (Channel 5) and NECN." at cumulative effects, like traffic, the impact on utilities, etc." with the community so there’s not a bright line between the community and the campus." “You know, we’ll only do this once. We’re only going to build the campus once. do it right and that’s good." In response to the comment posted this morning about difficulty downloading Harvard's 82 megabyte Insitutional Master Plan Amendment, I have divided the document into 4 smaller pieces. You can download them using these links. Also, I have printed copies to distribute so you can call me at (617)538-7038 if you would like one. Harvard Crimson story about Harvard's purchase last month of 176 Lincoln St. Thank you Harvard for starting to remove unsightly and unnecessary fences from your Allston properties. Hopefully these property improvements on Western Ave will be followed by many more throughout the neighborhood to help Allston look better for all of us. Want a printed copy of the Harvard Art Building Project Notification Form? There are also a few people in the neighborhood who have been given copies to distribute to people in the community. I have 10 copies. First come - first served. Give me a call at (617)538-7038 if you'd like one. I saw a poster in the Honan Library for The Steppingstone Foundation, and wanted to let people know about this great organization. The Steppingstone Foundation is a non-profit organization that provides free tutoring and admissions assistance for 4th, 5th, and 7th graders to help them improve their academic skills and gain admission to public exam schools and private schools. It also gives college counseling to students who have completed the program. Approximately 150 kids each year are accepted into the program and they take several hours of classes on afternoons and weekends during the school year and have a 6 week full-time session in the summer. Tuesday, January 9, 2007: English High School, Jamaica Plain, 6:30 p.m.
Saturday, January 20, 2007: Boston College High School, Dorchester: 10:00 a.m.
Here’s how members of the Legislature voted on a proposed 2008 ballot question that would ban gay marriage. The vote was 61-132 in favor of advancing the proposed constitutional amendment, but only 50 votes were needed to move it to a second constitutional convention this year. A “yes” vote was in favor of the ballot question; a “no” vote was against it. The average tax bill on a single-family home in Boston will jump 12.3 percent to $3,093 in 2007. That's on top of a 9.6 percent jump between 2005 and 2006. Since 2002, the presidency -- and consequently powerful committee chairmanships -- lay in the hands of Flaherty and his supporters, a group of white men in their 20s and 30s. Now some of those councilors may have to take a back seat, along with their initiatives, to an emboldened minority caucus. They include Flaherty; Michael Ross of Beacon Hill, Back Bay and Mission Hill; Rob Consalvo of Hyde Park; and Jerry McDermott of Allston-Brighton . YOU QUOTED Thomas Lentz, director of Harvard University Art Museums, describing my neighborhood as "Western Siberia" ("Harvard: New museum site is a better location, costs less," Style & Arts, Dec. 28). True, we are a wasteland of Harvard's creation. For decades, using straw companies and individuals, Harvard has snapped up homes and businesses, having left them empty to decay so that their distressed abutters become new opportunities for acquisition. Real people lose their homes and jobs, but the institution prospers, and that's what they teach at the Business School. My neighbors are not complainers. We desperately need to see Harvard succeed here and want only to be treated with respect and the honesty expected by a person in a Veritas tie. If Mayor Menino wants a "legacy," as you so often write, he should seek it on the campus of Harvard and the streets of Allston. Far better than another ugly skyscraper with someone else's name, eternal honor will belong to the one who negotiates the success of the new Harvard Square. Harvard's Museum of Natural History must leap forward from the 19th century. "The university museum has two major functions," said Dr. Steven E. Hyman, the provost of Harvard and a neuroscientist who has helped create exhibits for museums. "One is to support research, and the other is education." Unlike many science museums, Harvard has both a curatorial staff and affiliated researchers who use its collection of millions of zoological specimens. That collection, founded by naturalist Louis Agassiz in 1859, includes stunning fossils and preserved animals, which help make it Harvard's leading paid attraction. But the cramped quarters leave little room for new science. A move to Allston would add space but subtract historical significance. "The Museum of Natural History is also a museum of museums," noted Hyman. "It was the first collection to be displayed like that for public consumption." The new Harvard report suggests that a move would help the museum's educational side, perhaps through a new "Museum of Evolution" combining different elements of the university's collection. "In the Allston era, we'll have an opportunity to invigorate the museum component of the university," said Stubbs.